Listen, Ladies’ host Maryalice Aymong interviews Julie Greene, co-founder and co-director of The Women’s Bakery. The organization works with women in East Africa to develop economically sustainable bakeries in their local communities. While the organization’s staff works to train aspiring business owners and assist in getting businesses off the ground, its ultimate goal is to transfer ownership of each business to the women involved. 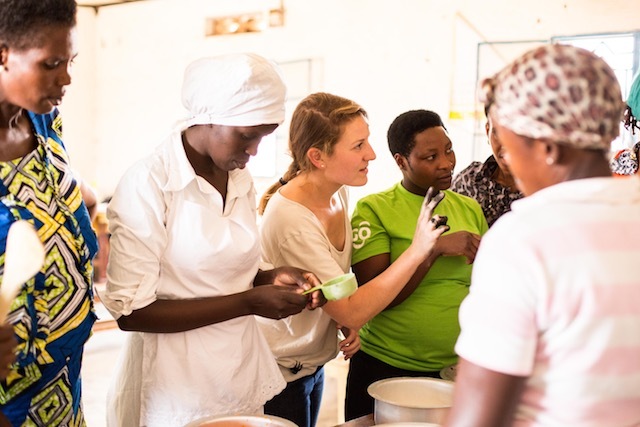 Julie is based in Rwanda where she works to facilitate the daily operations and mission of the organization. Listen Ladies (LL): Before we get into the mission of the organization, I would love for our listeners to hear a little bit more about you and how this seed was hatched. How did you develop an interest in East Africa? What is your background? Julia Greene (JG): My first experience in East Africa was actually when I was an undergrad. I did a study abroad in Tanzania and I really enjoyed my time there. After school I was looking to get back to East Africa. I ended up applying to the United States Peace Corp, and I was assigned to Rwanda. I then spent a little over two years living in rural Rwanda, teaching secondary school through the Peace Corp. And that furthered my interest in international work, specifically women’s empowerment and creating opportunities for women and girls. LL: Tell us about the mission of The Women’s Bakery. What’s its philosophy? And I know you have a big team, so how did this come together? JG: The mission of The Women’s Bakery is to empower women through business and education with a heavy emphasis on the latter. We not only provide a lot of training before each bakery opens but throughout the life of each operation, and our training is well rounded. In addition to teaching commercial baking, we teach the women life skills, nutrition, and business skills like marketing, sales and accounting. How did that all get started? It is a long story, but I will give a brief summary. At the same time that I was in the Peace Corps here so was my co-founder, Markey Culver. We were both in rural communities working with women on generating activities. We both started making different kinds of bread. She was making traditional yeast bread, and I was making a quick banana bread. But we both saw the opportunity to make bread using ingredients that were already around in the communities. Then we used that bread as a way to provide the women with employment. Markey was the one to start the first bakery. She did that in 2013. We had been in touch, so in 2014 she asked me if I wanted to join her in expanding it and building more bakeries throughout East Africa. I joined her in 2014, and we’ve been building bakeries and learning quite a bit as we go ever since then. LL: Tell us a little bit about the women who apply for the program. JG: We work with other nonprofit organizations already working in communities, and usually these are women’s co-ops. We partner with them, and they help us vet the participants for the training program as we do have an application process. We try to make sure our program is a good fit for each applicant, which mostly comes down to does she really have the time and dedication to go through the entire training process and eventually work for the bakery full time? We generally look for single mothers in their 30s with little formal education, low monthly income, and three or more children to support. These are the women who stand to benefit most from gaining the skills that will enable them to provide for themselves and their families. 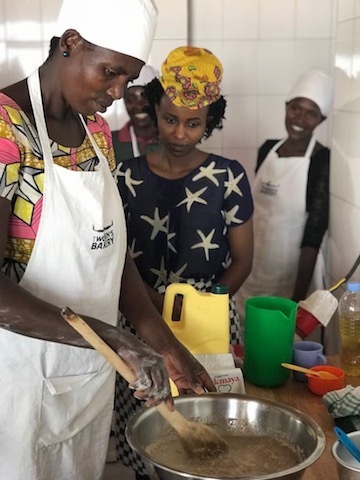 Remera Training – TWB Director of Impact, Meg, runs a baking lesson during the training of our first Rwanda cohort in 2015. LL: I mentioned that the ultimate goal of The Women’s Bakery is transferring ownership of the businesses to the women once they’ve completed training. Why is that a significant part of what you do, and how do you know when a bakery has reached the point where you can step back? JG: We are honestly still trying to figure that out. Our long-term goal is definitely to make sure these bakeries can be run and managed by the groups of women themselves. We actually only have one bakery so far that has reached this point, so we don’t really have the formula down yet for how long it takes. There are a lot of factors that come into play in terms of how much time people can give and how much risk people are willing to take both personally and financially. We are seeing across most of our bakeries that people at the beginning are not as interested in the ownership piece, and that’s okay. The focus for a lot of the women is steady employment. We hope that over time some all of the people within the bakery will want to buy equity in the business; and if that takes five or ten years, that is okay. We are still learning as we go, and right now what we do is basically own and manage each business until it seems as though it can be managed independently of us. That process looks very different for each bakery, each group of people, each community. There is no one-size-fits-all model. To listen to the whole interview download Listen, Ladies in iTunes. Top photo: Kagina Training Graduation — TWB’s fourth training cohort in Rwanda, located in Kamonyi District, graduated in Summer 2017. 5 women work in the bakery full time, 4 pictured here along with TWB staff from left to right Co-Founder Julie, Training Manager Aime, and Bakery Operations Manager Yvonne.